Lock in a great price for Boucan by Hotel Chocolat – rated 9.3 by recent guests! View from our room was spectacular! The food at the hotel restaurant was out of this world. Must try the chocolate martini! All. The service was impeccable. The staff was welcoming. Restaurant food was amazing and staff were so friendly and helpful! The property is beautiful, and the lodge we stayed in was fantastic -- wood floors, open to a beautiful view of Petit Piton, with a large bathroom and a shower area open to the sky. Bite-size chocolate chip cookies and truffles in our room were a delightful treat too! Breakfast was included, and it was wonderful, with a variety of breakfast items and a special entree each day. We arrived a little early to check in, and enjoyed lunch in the open air restaurant that overlooks an infinity pool and the views toward the Pitons and ocean sunsets. It was not far to the Gros Piton Trail Hike, which we did, and Anse Chastanet Beach, a good snorkeling site. The bed and turn down service were fabulous. Every employee was happy and made us feel welcome. Every meal included chocolate, and you can't go wrong with that. No AC, only fresh air, sounds of nature and magic view of Pitons. The staff was the best part of this hotel - they arranged everything and went above and beyond to be sure I was having a great stay. The surroundings were very lush and beautiful and the food quite good. Hotel Chocolat was absolutely fantastic and one of our favourite places on our trip. 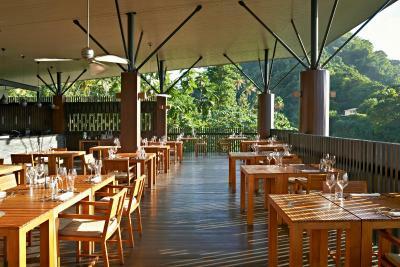 The contrast between luxury and fine dining within a jungle setting was amazing. A refreshing break from a typical resort. I would highly recommend a stay here. Boucan by Hotel Chocolat This rating is a reflection of how the property compares to the industry standard when it comes to price, facilities and services available. It's based on a self-evaluation by the property. Use this rating to help choose your stay! One of our top picks in Soufrière.This boutique hotel provides stylish, modern décor and is in a spectacular rainforest setting, 4 miles from Soufriere Town Centre. In an 18th-century cocoa estate, Hotel Chocolat features an inviting infinity pool with stunning views of the Piton Mountains. The rooms overlook the Caribbean Sea and offer contemporary décor, iPod docking stations and a private terrace. They feature exclusive REN toiletries and dual open-sky rain showers, and guests will also find a concierge cabinet that includes chilled Prosecco and freshly-made estate chocolates. The cocoa estate is also home to rare, ancient trees, which are of significant scientific and historic interest. 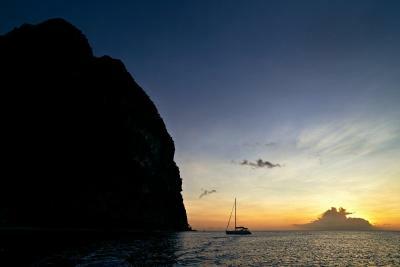 Boucan by Hotel Chocolat is 5.5 miles from Pitons Bay and 14 miles from St. Lucia Hewanorra International Airport. 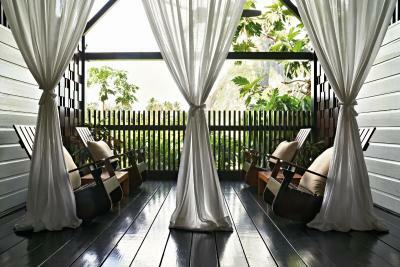 When would you like to stay at Boucan by Hotel Chocolat? This accommodations are surrounded by lush gardens and feature rain showers. Set on an elevated spot, this accommodations offers stunning views of the Caribbean Sea from its private balcony. House Rules Boucan by Hotel Chocolat takes special requests – add in the next step! Boucan by Hotel Chocolat accepts these cards and reserves the right to temporarily hold an amount prior to arrival. Please note that due to the steep terrain and positioning of the hotel, it is not suitable for wheelchair users or guests with reduced mobility. The staff is excellent, manager on duty went out of his way to make my stay comfortable. I needed a table and chair to work in my room and this was arrange quickly. The food is excellent, the complimentary chocolate and coconut treats are appreciated. The pool area is the best with the view of the Piti Piton. The luxe room is breathtaking. The only thing that could be improved was the bed being a little more comfortable. The staff super helpful and friendly. The restaurant has excellent food! The rooms are huge and have an amazing view of the petit Piton. First what isnot to like. Absolutely amazing. We arrived early and of course our room was not ready - who would check out early from a place like this given the flight times. However, after a welcome cocktail (you could choose from absolutely anything on the menu for free) we decided to have lunch. Good decision - delicious and light. Relaxing by the pool (where there are towels and a cool shower) we were told our room was ready and our bags were already in situ. We had a deluxe tree house (best way to describe it and worth paying the extra for unless you have a problem with stairs then avoid). Amazing. Totally private balcony with beautiful outdoor lounging furniture. Bed amazing with a mosquito net surrounding. We used it but were never bothered with those creatures. If you have a problem with geckos this is not the place for you. To be fair we only saw one but if that kind of thing bothers you you would not like the indoor outdoor approach. However it was perfect for us and the shower in the bathroom will be copied back home. Simply delicious. As was the food. Initially not sure about chocolate with everything but it works It is not always sweet but has a savoury blast when added to meat. We left with 20 bars of their 70% chocolate and a cocoa pod made out of clay. What more can I say and I don't even love chocolate! Would recommend the trip to the sulphur spa (get the hotel to order taxi to take you and wait - really worth it and very inexpensive as 10 mins away as you can go both into the volcano and into the hot sulphur mud bath with very little walking. Hotel can organise. Also take the trip to Sugar Bay resort. This is free transport from the hotel. You have to pay to get in to the resort but fully redeemable against lunch and drinks on the beach and so worth it. The staff there could not have been nicer even though they knew we were visiting from Hotel Chocolat and not staying at the hotel which is very expensive and exclusive. The staff was friendly, the food delicious. The room was comfortable and bed was fabulous. Loved sitting by the pool viewing the pitons. We stayed Saturday to Monday and there were no chocolate tours at the weekend and the Monday tour was cancelled. We stayed in a luxe lodge and the views were amazing. The pool was beautiful. Food in the restaurant was excellent. Free welcome cocktails were a nice surprise. Road noises are very loud. Would t seem that would be the case but it is. Loud all hours of the night and morning. the rooms are dark and quite small. Between the mosquitos in the room and the constant nature noise (open space concept) it was hard for us to fall asleep. the view and the restaurant. The food was delicious. The service at breakfast was really poor - it took over an hour to get our main course and then it was not correct and we had to ask repeatedly for bread. we went down to breakfast at 7.45 on the second day to ensure the 9.30 shuttle to Soufriere and only finished at 9.15 !!!!! in fact we cancelled one of the dishes to save time. Our order was not complicated either and we are generally very laid back and rarely complain. the staff weren't very friendly either. The food was very good and the staff across the whole site were really friendly and helpful and nothing was too much except for the breakfasts. I was upgraded to an excellent "Lux Lodge", which was really good with a view to Petit Piton. The open plan room worked well, with small birds regularly flying in and out. Food also excellent.